Card Text Play/Fight/Reap: Destroy an enemy creature or artifact and a friendly creature or artifact. Discard the top card of your deck. If that card is not a Logos card, trigger this effect again. Does Neutron Shark’s ability effect trigger again if Neutron Shark destroys itself? No. 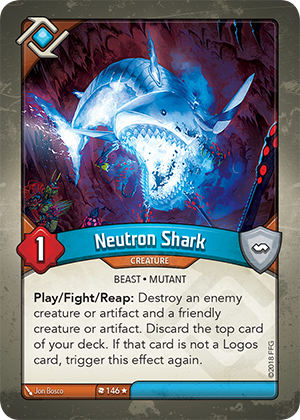 Once Neutron Shark leaves play, the effect completes (discarding the top card of your deck) and it cannot trigger again.